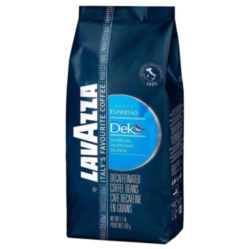 Lavazza Dek Espresso Decaf Coffee contains pure Arabica whole coffee beans. Caffeine is removed by using a water-based process. One case = twelve 1.1lb bags. $0.77 / oz. $0.74 / oz. $0.71 / oz. $0.68 / oz.